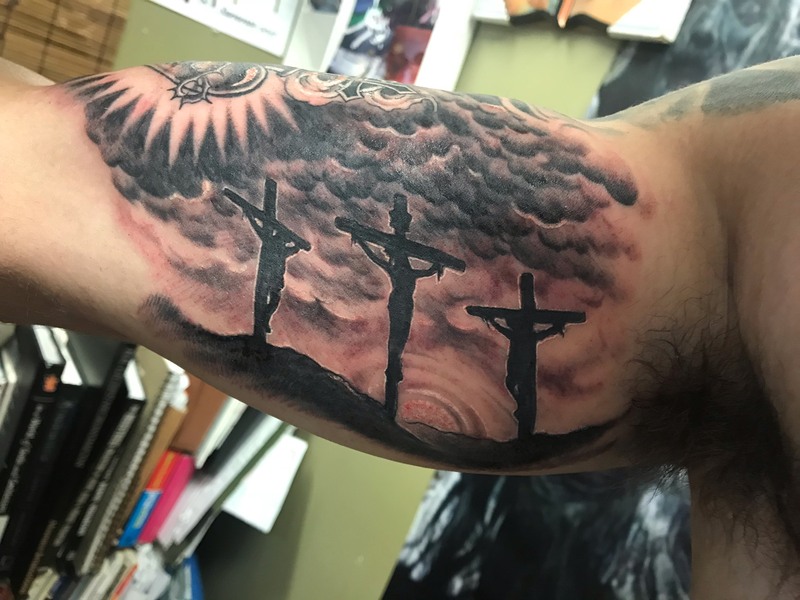 Tattoos hold different meanings for different people, but for Matt Pangle, they are a statement of his faith and what it has meant in his life. I have a few tattoos; a half sleeve (work in progress) on my right arm which is three parts. I have a sacred heart on my bicep, the Calgary scene on the inside of my bicep and a portrait of Saint Matthew on the outside of my arm. I also have a cross with two verses on my right shoulder blade (Psalm 23:4 and Jeremiah 29:11). I have Phil 4:13 on my thigh and the Greek word κενόω on my shin. κενόω means to empty yourself or to be unfilled. It was our theme last year for wrestling, kind of like “leave it all on the mat” or hold nothing back. I also have a small tattoo on my left wrist that is a shared tattoo with my mom, mine says “HE died for me” and hers says “I live for HIM”. When did you get your tattoo? I got my first tattoo when I was 17, right before senior year of high school. That was the cross on my back. 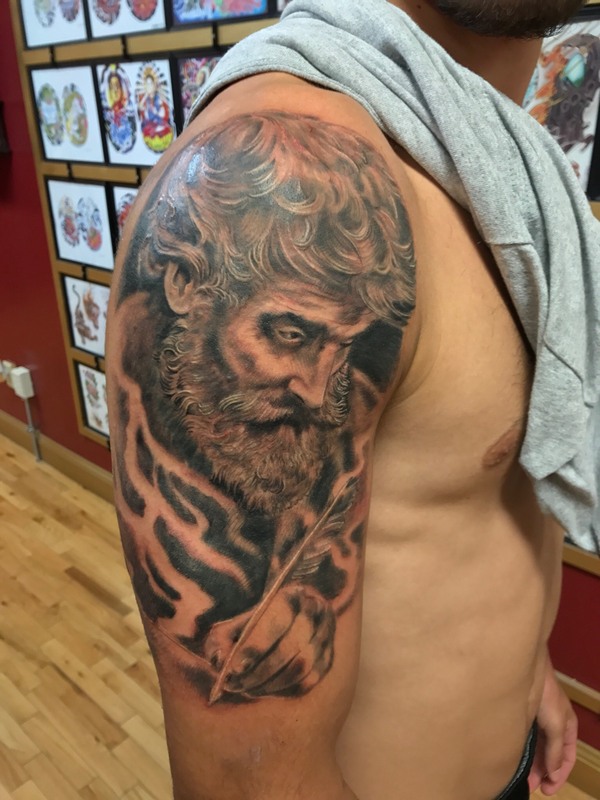 Then I got another one during my senior year (my portrait of Saint Matthew). The rest I have gotten between spring break last year and now. All of my tattoos are a part of me, they mean a lot to me. They each have a story behind them and a connection to some aspect of my life as a Christian. I have some of my go-to verses tattooed on me, they mean a lot to me. What inspired you to get a tattoo in the first place? I guess my cousin did. I always thought they were really cool and then when he got one I really wanted one. Even if he didn’t get one I’d still probably have gotten all my ink. It’s a big part of who I am and I would feel weird without them. But my cousin really opened the door and kind of broke the stereotype in my house that tattoos were bad. Are you planning on getting anymore, and if so, do you know what you would get? Yes, I plan on getting quite a few more. I’m finishing my half sleeve over spring break and starting to connect it onto my chest. And I also plan to do the inside of my left calf. I’d probably either do something with the lion and the lamb or some other biblical scene for that one. And I’ll probably get more than that but sometimes ideas just pop into my head for what would look good and I just kind of go for it.